This is the engineer’s dream website. There are thousands of parts and assemblies available, many of them customizable and all of them free. A lot of the digital parts are created and uploaded by the suppliers of those parts, and that separates 3D Content Central from other repositories. It makes the site like a giant, virtual warehouse of nuts, bolts, flanges, pipe connectors, gears, and everything else. The site doesn’t specifically cater to 3D printing, but because of the engineering emphasis, many of the CAD/CAM files are printable due to being created in SolidWorks. All models in this section of the Shapeways site are free and tested to “print for sure.” Unfortunately I’ve never made it into this section; there’s a link loop and an error that prevent navigating to the parts. So if any Shapeways employee reads this, please pass it on and let us at the free stuff. CG Trader is another repository that isn’t dedicated to 3D printing but has wisely adopted support. 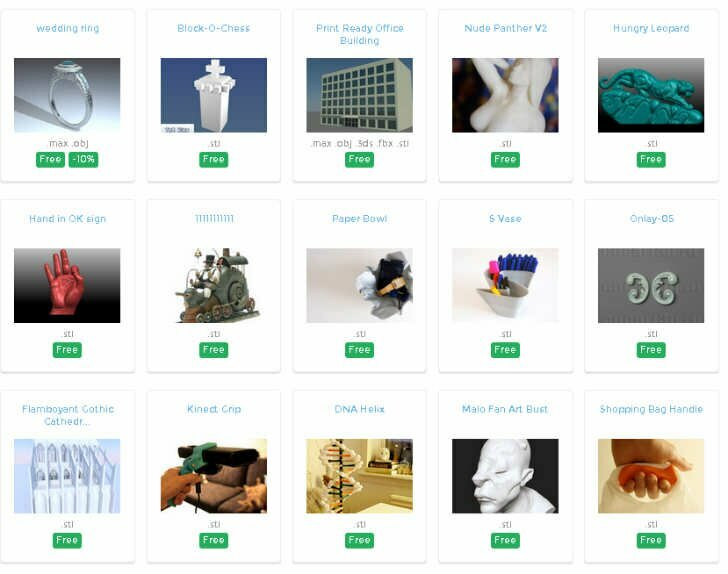 By clicking the “3D print ready” and “free” filters, all available models can be browsed, searched, and downloaded. There’s not a huge selection, but it’s growing. 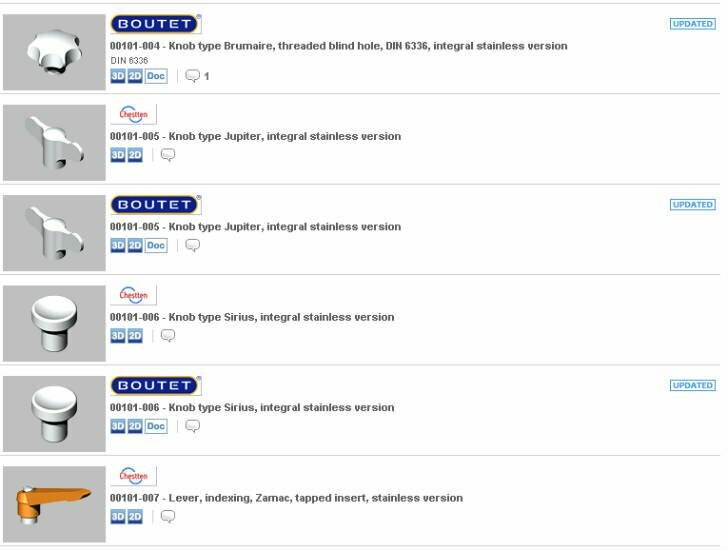 Yes, the company that produces the most consumer-oriented 3D printer, the Cube, and distributes some of the easiest-to-use CAD/CAM software (Invent, Design, and Sculpt), also hosts a 3D file repository/shop. Most of the models are for sale, uploaded by designers and Cubify, but a lot are free. I’ll be honest; part of the reason I’m posting this now rather than earlier is because Cubify only recently separated the free from the rest. Before that users had to click through all the pages to find the free ones and I didn’t want to tell readers to do that. Thanks Cubify. 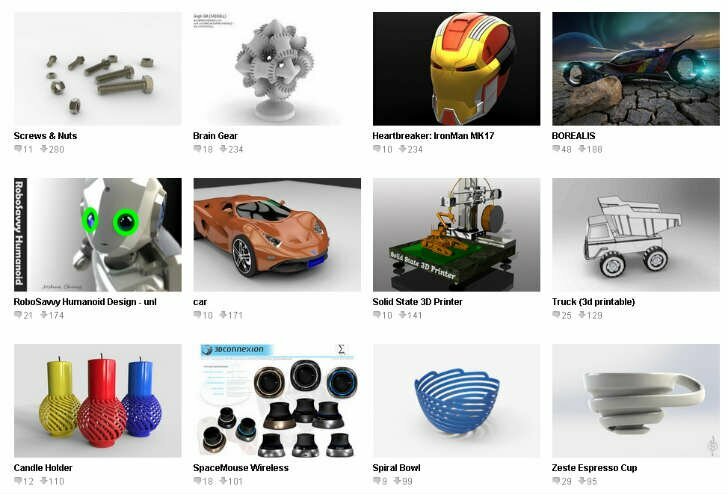 Another engineering CAD site is GrabCAD, which is specifically designed to help artists/engineers collaborate on models. There’s a 3D printing category with a load of pages of models. The community is especially robust here with a large and active user base participating in regular challenges, so if you like to give/receive feedback and interact with other designers then definitely check out GrabCAD. My favorite, clearly. 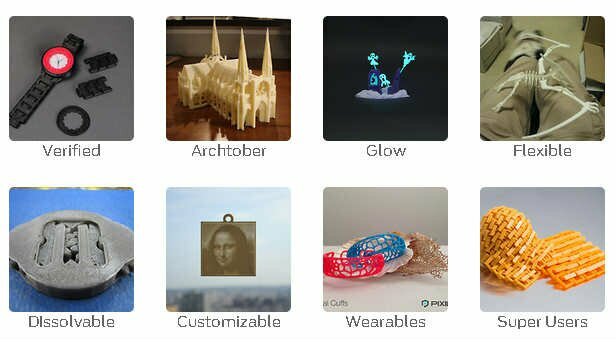 It’s the only one on this list that’s (mostly) dedicated to 3D printing where everything is free. It’s owned by MakerBot, which is now owned by Stratasys. The user base is incredibly active, large, and growing, and there are challenges that reward Replicator 2s. There are so, so many printable models, most of which include helpful print settings from the creator and other users that have printed the objects. 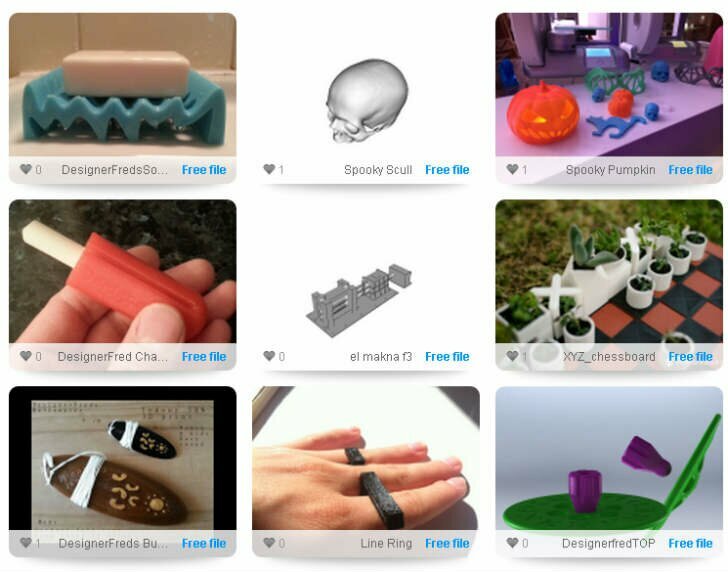 If the thought “I wonder if anyone has modeled this,” occurs to you, search Thingiverse first. Similar to 3D Content Central, here we find a large database of mechanical and engineering related parts that can be downloaded in a variety of file formats. Again, many of the models are from suppliers, so you know they’re accurate. There you have it. If you’re looking for a pre-modeled object, run your search through this list. It’s by no means a complete list, so if your favorite isn’t shown then please do share.